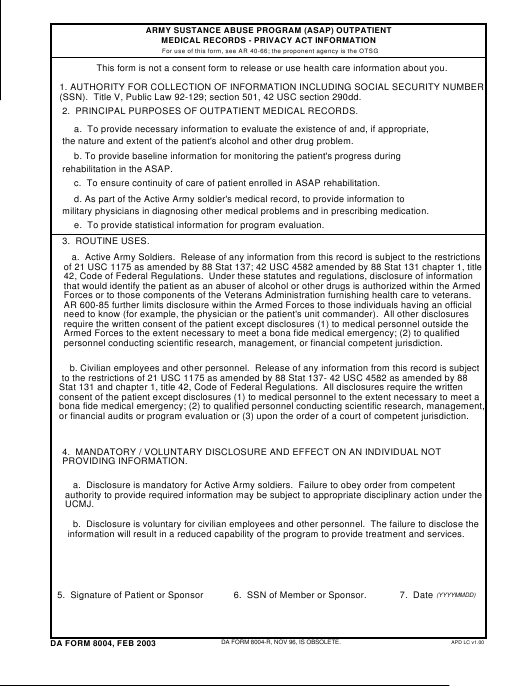 DA Form 8004 or the "Army Sustance Abuse Program (asap) Outpatient Medical Records - Privacy Act Information" is a Department of the Army-issued form used by and within the United States Military. The form - often incorrectly referred to as the DD form 8004 - was last revised on February 1, 2003. Download an up-to-date fillable DA Form 8004 down below in PDF-format or look it up on the Army Publishing Directorate website. This form is not a consent form to release or use health care information about you. (SSN). Title V, Public Law 92-129; section 501, 42 USC section 290dd. 2. PRINCIPAL PURPOSES OF OUTPATIENT MEDICAL RECORDS. the nature and extent of the patient's alcohol and other drug problem. c. To ensure continuity of care of patient enrolled in ASAP rehabilitation. military physicians in diagnosing other medical problems and in prescribing medication. e. To provide statistical information for program evaluation. Forces or to those components of the Veterans Administration furnishing health care to veterans. personnel conducting scientific research, management, or financial competent jurisdiction. or financial audits or program evaluation or (3) upon the order of a court of competent jurisdiction. information will result in a reduced capability of the program to provide treatment and services. 6. SSN of Member or Sponsor. DA FORM 8004-R, NOV 96, IS OBSOLETE.